Zephaniah Phiri’s Book of Life Mazvihwa in Print! The stone wall journey started in Madzoke valley, a community which is surrounded by mountains and hills. This community has a very great access to stones because it is situated between mountains. However, the same mountains prey a lot of animals which destroys their crops and small livestock thereby affecting their livelihood. 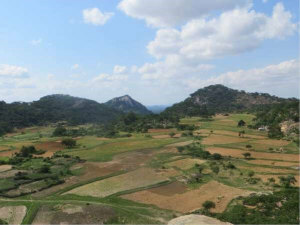 These communities need the stone walls to help them herd their cattle, of which they need many for draught power and manure. The cattle are hard to control by herding, especially with fewer children, and in most cases children will be at school. 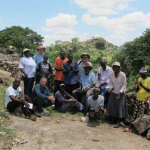 The community through motivation from Doctor Ken Wilson who has been in the area for more than 30 years and lessons from Muonde researchers about the dangers and disadvantages of cutting down trees, the community adopted the stone wall. Without the stone walls and expensive wire fences people make fences by heaping brushwood from cut live trees, even though there are now more than twenty clever different ways of doing this strongly with less wood it is still using too much of the forest and taking people too much time to do it so they are looking for solutions thereby adopting stone walling. Madzoke wall before Paul Nash’s visit, The people had will and power but they just lacked the proper skill to make strong walls. 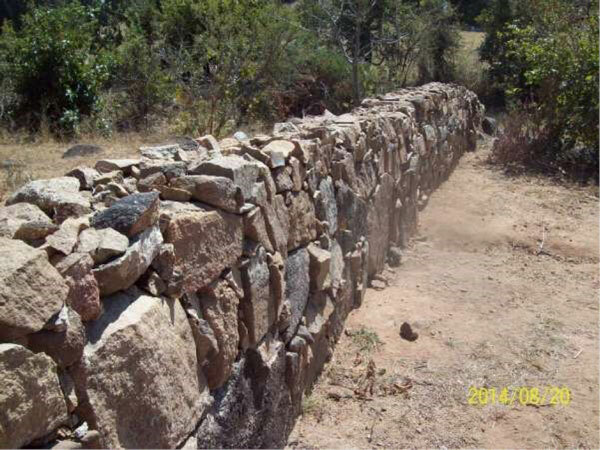 When they started to make their wall they made many discoveries on the advantages of the stone wall. The most important and crucial one to them was that it scared the animals away, as compared to the tree branches which were easily destroyed by animals. 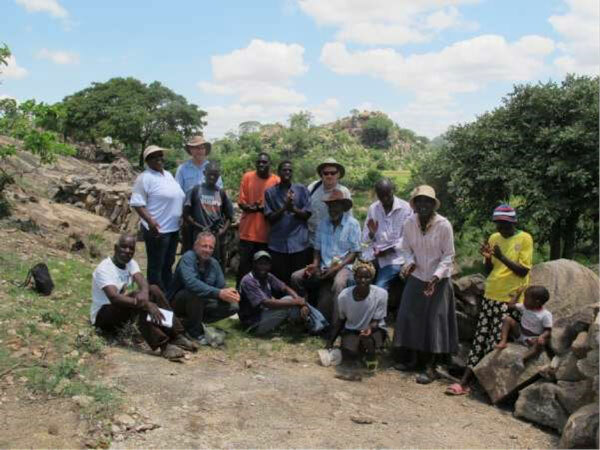 When a team of volunteers volunteers came together with Dr Ken Wilson in January 2014 they discovered the will that these people have and decided to facilitate the coming of a professional stone Waller. 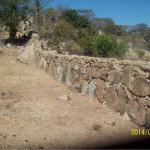 Paul Nash was later invited to come to Zimbabwe and Mazvihwa area to assist people in making good stone walls. 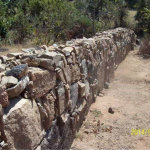 Paul took it upon himself to teach people all the basic knowledge that is needed for one to make a good stone wall. He made sure that they will be able to work and build more stones even after his departure. Paul Illustrating how to make an H frame (which is used to build stone walls) while Chirindira is assisting. The communities are now able to make beautiful and strong walls. The stone walling is also restoring the spirit of working together which had been eroded. This has been made possible because people are working together as a group instead of everyone having to make their own wall they collaborate to make one big, but shorter, wall around all the fields in one area from which everyone benefits. 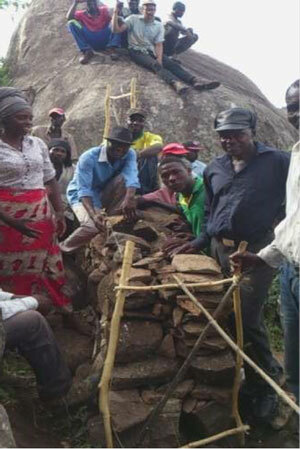 People are very happy about what Paul taught them one of the community leaders in Madzoke valley Mr Pileck said, “Dombo haribiwi matigadzirira nhaka yevana vedu nevana vavo.” You cannot steal a stone it is a heritage that will be passed through generations. 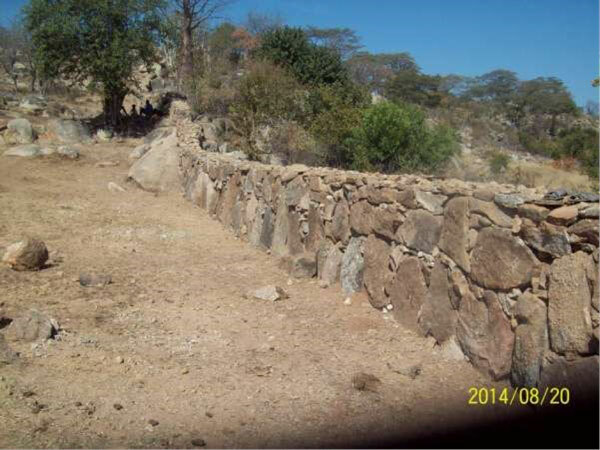 The Madzoke stone wall is now 1400m long. This community is also planning to make a strong paddock using the stones. 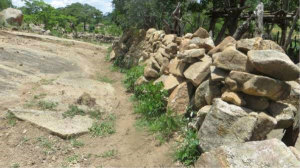 Community leadership is also in support of stone walls and the also attended the trainings done by Paul Nash in Madzoke Valley. Headman Madzoke and Ward Councillor Mvuto are fully participating. 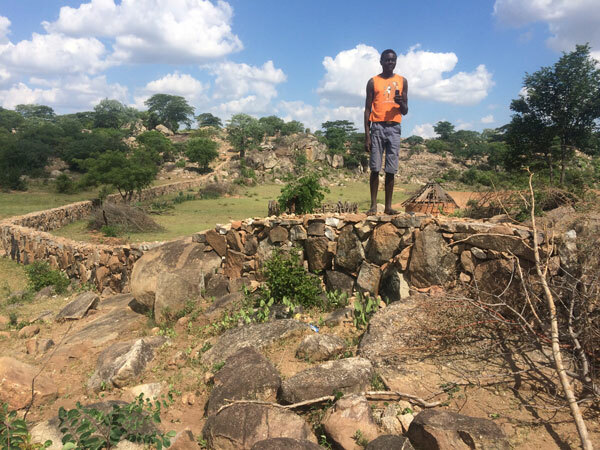 The Pilek family has built nearly 2kms of wall to protect their fields at the northern end of the Madzoke valley. On the wall is Krane, aged 17, one of the Pilek children who worked hard towards this incredible achievement. 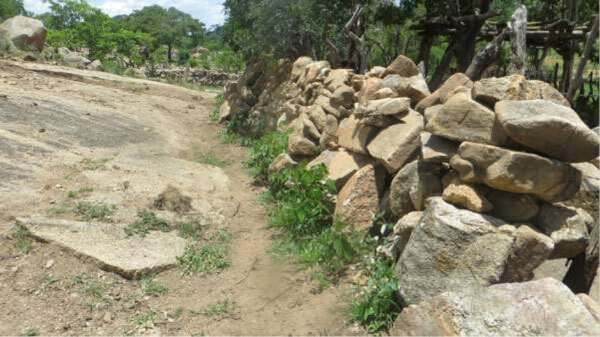 Doctor Ken Wilson made a very interesting observation: the stone walls traditionally built in Zimbabwe turn out to be very similar to the technique from the Cotswolds taught by Paul Nash. 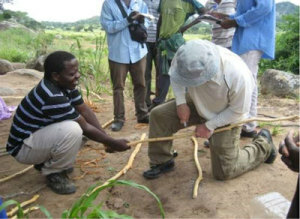 So English traditional knowledge and Zimbabwean traditional knowledge have been connected to solve an Agricultural Problem. In a nutshell the walls are making people very proud and happy because they are beautiful to the eye. They are strongly made so that they don’t fall on children who might climb on the wall. “Inhaka youpenyu tichafa tikasiya zvakadaro.” -Garikai Shava This is our heritage. We will die, and leave it still functional. “Matombo ndigoruzhowa gwakanaka gunoderedza kutemwa kwemiti,uye isu tayeudzirwa kuti nyika yedu Zimbabwe zita rayo rakabva pakuvaka rusvingo nematombo.” -Abraham Mawere Use of stones leads to the reduction in cutting down of trees and our country’s history and name emanates from the use of stones to build houses and stones as evidenced by the Great Zimbabwe. Paul Nash with team at former stone wall. Madzoke Wall meandering into the Mountain.